Max Bruch belongs to a select group of composers who sold the copyrights of their greatest hits for a pittance and spent the rest of their lives bitterly regretting their hasty actions—two others were Edward Elgar (Salut d’amour) and Fats Waller (Ain’t Misbehavin’, Honeysuckle Rose). The work in question was Bruch’s Violin Concerto No 1 in G minor, Op 26, which nowadays comes at or near the top of listeners’ polls as the most popular violin concerto, and is routinely bracketed with those by Beethoven, Mendelssohn, Brahms and Tchaikovsky. 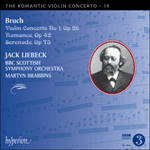 Bruch, born in Cologne in 1838 and trained by Ferdinand Hiller and Carl Reinecke, began writing the G minor concerto in the summer of 1864, when he was based in Mannheim and had recently met the great Hungarian violinist Joseph Joachim. During the concerto’s tortuous gestation, Bruch moved to Koblenz in 1865 to take the post of Court Kapellmeister and then moved on again in 1867 to Sondershausen. Along the way he rewrote the concerto ‘at least half a dozen times’, and a number of violinists were associated with its development and the refining of the solo part, although the major contribution was made by Joachim, himself a fine composer. ‘My violin concerto is progressing slowly—I do not feel sure of my feet on this terrain’, Bruch wrote to his old teacher Hiller in November 1865. That perceptive critic Clara Schumann liked what she saw when the manuscript was shown to her, however, so the work presumably already revealed individuality. Bruch sought technical advice from the Mannheim concertmaster Johann Naret-Koning and by early 1866 he had completed his first draft. This version was premiered in Koblenz on 24 April, at the last winter concert of the Musik-Institut, with Bruch conducting and Otto von Königslöw, professor at the Cologne Conservatory and leader of the Gürzenich Orchestra, as soloist. Having heard it in performance Bruch was dissatisfied, and during the summer he sent the manuscript to Joachim in Hanover. In August he received a very detailed letter, making a number of structural suggestions. Joachim also reassured him that it was appropriate to call the work a concerto rather than a fantasy. After making his revisions and detailing them to Joachim, Bruch went to Hanover, where the two men worked together on the concerto and then performed this second version with the Court Orchestra. Bruch also received advice from the conductor Hermann Levi and the celebrated Leipzig violinist Ferdinand David; and in October 1867 he spent more time working on the concerto in Hanover with Joachim. On 5 January 1868, Joachim premiered the final version in Bremen, with Carl Martin Reinthaler conducting; and he repeated it in Hanover and Aachen. On 6 July it was introduced to London at a Philharmonic Concert in the Hanover Square Rooms, conducted by W G Cusins, with the orchestra’s Austrian concertmaster Ludwig Straus as soloist. The critic of The Times found it ‘full of pretension, but almost destitute of interest’, a verdict posterity has not endorsed. The Spanish violinist Pablo de Sarasate, who would actively champion Bruch’s violin music, gave the American premiere in New York on 3 February 1872, with the New York Philharmonic under Carl Bergmann, and also played the concerto in Paris, Lyons and Brussels. Bruch follows Mendelssohn in having the three movements play almost continuously. At the start he pays homage to Beethoven by opening with a soft timpani roll and takes another leaf out of Mendelssohn’s book by doing without a full orchestral tutti. Instead orchestra and soloist alternate brief flourishes before the orchestra sets the Allegro moderato on its way. Bruch carefully styles this movement a Prelude because, although it is basically in sonata form with the usual two contrasting themes, he telescopes the recapitulation into almost nothing. After the return of the opening flourishes, the orchestra ushers in a meditative passage for the soloist, leading to the beautiful first theme of the Adagio. Again, although this lovely movement—the heart of the concerto—is essentially in sonata form, with three themes, its recapitulation is drastically foreshortened. The Finale (Allegro energico) is introduced by the orchestra and the solo violin takes off on a Hungarian-tinged theme, no doubt a tribute to Joachim, with characterful double-stops. It is most unusual to have all three movements of a concerto in sonata form but, as noted, Bruch treats this form in an original and arresting way. The second theme of the Finale is broader, allowing the soloist points of expansion, and the closing Presto wind-up, combining both themes, is extremely exciting. The G minor concerto was always Bruch’s most popular work, eclipsing his other music even in his lifetime, greatly to his irritation. Its length made it easy to programme, while its strong melodic profile helped audiences to take it in at first hearing. Its hold on the repertoire was strengthened in the 1950s, when it turned out to be the ideal length for an LP record side and many companies coupled it with Mendelssohn’s E minor concerto. Having sold it outright to the publisher August Cranz for 250 thalers, Bruch reaped no benefit from its popularity—it would have provided him with a pension in his last years, when he lived in penury. The final insult was being cheated out of the manuscript, six months before his death, by the American sisters Rose and Ottilie Sutro, for whom he had written his concerto for two pianos. Max Bruch fait partie de ces quelques compositeurs qui vendirent pour trois fois rien les droits d’auteur de leurs plus grands succès et passèrent le reste de leur vie à regretter amèrement cette décision inconsidérée—Edward Elgar (Salut d’amour) et Fats Waller (Ain’t Misbehavin’, Honeysuckle Rose) firent de même. L’œuvre en question, c’est le Concerto pour violon no 1 en sol mineur, op.26, de Bruch considéré aujourd’hui dans les sondages auprès des auditeurs comme le concerto pour violon le plus apprécié au même titre que ceux de Beethoven, Mendelssohn, Brahms et Tchaïkovski. Né à Cologne en 1838, Bruch fit ses études avec Ferdinand Hiller et Carl Reinecke; il commença à écrire le Concerto en sol mineur durant l’été 1864, lorsqu’il résidait à Mannheim et venait de faire la connaissance du violoniste hongrois Joseph Joachim. Pendant la gestation tortueuse de ce concerto, Bruch déménagea à Coblence en 1865 pour prendre le poste de Kapellmeister de la cour, puis à Sondershausen en 1867. Au cours de cette période, il réécrivit le concerto «au moins une demi-douzaine de fois» et plusieurs violonistes furent associés à son évolution et au peaufinage de la partie soliste, mais la contribution majeure fut celle de Joachim qui était lui-même un bon compositeur. «Mon concerto pour violon progresse lentement—je ne suis pas sûr de moi sur ce terrain», écrivit Bruch à son vieux professeur, Hiller, en novembre 1865. Toutefois, Clara Schumann, critique perspicace, aima ce qu’elle vit lorsque le manuscrit lui fut soumis et l’œuvre devait donc sans doute déjà révéler une certaine originalité. Bruch rechercha les conseils techniques du violon solo de Mannheim, Johann Naret-Koning, et au début de l’année 1866, il avait achevé sa première ébauche. Cette version fut créée à Coblence, le 24 avril, au dernier concert hivernal du Musik-Institut, sous la direction de Bruch, avec en soliste Otto von Königslöw, professeur au Conservatoire de Cologne et violon solo de l’Orchestre du Gürzenich. Après l’avoir entendu, Bruch fut mécontent et, au cours de l’été, il envoya le manuscrit à Joachim à Hanovre. En août, il reçut une lettre très détaillée, avec plusieurs suggestions structurelles. Joachim le rassura aussi en lui disant qu’il était plus approprié d’appeler cette œuvre concerto que fantaisie. Après avoir fait ses révisions et les avoir exposées en détail à Joachim, Bruch se rendit à Hanovre, où les deux hommes travaillèrent ensemble au concerto, puis jouèrent cette deuxième version avec l’Orchestre de la cour. Bruch reçut également les conseils du chef d’orchestre Hermann Levi et du célèbre violoniste de Leipzig Ferdinand David; et en octobre 1867, il travailla encore au concerto à Hanovre avec Joachim. Le 5 janvier 1868, Joachim donna la première exécution de la version définitive à Brême, sous la direction de Carl Martin Reinthaler; et il la rejoua à Hanovre et Aix-la-Chapelle. Le 6 juillet, le concerto fut présenté à Londres à un concert philharmonique aux Hanover Square Rooms, sous la direction de W. G. Cusins avec le violon solo autrichien de l’orchestre, Ludwig Straus, en soliste. Le critique du Times le trouva «plein de prétention, mais presque dénué d’intérêt», verdict que la postérité n’a pas fait sienne. Le violoniste espagnol Pablo de Sarasate, qui allait défendre activement la musique de Bruch, en donna la première exécution américaine à New York, le 3 février 1872, avec l’Orchestre philharmonique de New York sous la direction de Carl Bergmann, et joua aussi ce concerto à Paris, Lyon et Bruxelles. Bruch s’inscrit dans la ligne de Mendelssohn en enchaînant les trois mouvements presque sans interruption. Au début, il rend hommage à Beethoven en commençant par un doux roulement de timbales et s’inspire aussi de Mendelssohn en se passant d’un grand tutti orchestral. À la place, l’orchestre et le soliste alternent de brèves fioritures avant que l’orchestre lance l’Allegro moderato. Bruch qualifie prudemment ce mouvement de «Prélude» car, s’il est fondamentalement écrit en forme sonate, avec les deux thèmes contrastés habituels, il condense la réexposition en presque rien. Après le retour des fioritures initiales, l’orchestre introduit un passage méditatif pour le soliste, menant au magnifique premier thème de l’Adagio. Une fois encore, même si ce très beau mouvement—le cœur du concerto—est essentiellement en forme sonate, avec trois thèmes, sa réexposition est sévèrement raccourcie. Le Finale (Allegro energico) est introduit par l’orchestre et le violon solo décolle sur un thème de caractère hongrois, sans aucun doute un hommage à Joachim, avec des doubles cordes originales. Il est très rare que les trois mouvements d’un concerto soient en forme sonate mais, comme on l’a noté, Bruch traite cette forme d’une manière originale et saisissante. Le deuxième thème du Finale est plus large, ce qui permet au soliste de s’épanouir, et le Presto conclusif, qui associe les deux thèmes, est très excitant. Le Concerto en sol mineur fut toujours l’œuvre la plus populaire de Bruch, éclipsant le reste de sa musique, même de son vivant, ce qui l’irritait beaucoup. Sa longueur le rendait facile à programmer, et son profil mélodique fort permettait aux auditeurs de le comprendre à la première écoute. Son emprise sur le répertoire se renforça dans les années 1950, lorsqu’il s’avéra avoir la longueur idéale pour une face de disque 33 tours et de nombreux éditeurs discographiques l’associèrent au Concerto en mi mineur de Mendelssohn. L’ayant vendu comptant à l’éditeur August Cranz pour 250 thalers, Bruch ne récolta aucun bénéfice de sa popularité—il lui aurait valu une pension à la fin de sa vie lorsqu’il était dans le besoin. Et, ultime coup de grâce, il fut dépouillé du manuscrit six mois avant sa mort par les sœurs américaines Rose et Ottilie Sutro, pour qui il avait écrit son concerto pour deux pianos. Max Bruch gehört zu der auserlesenen Gruppe von Komponisten, die die Urheberrechte ihrer erfolgreichsten Werke für einen Hungerlohn verkauften und dann den Rest ihres Lebens ihr voreiliges Handeln bitter bereuten—bei den anderen beiden Kandidaten handelt es sich um Edward Elgar (Salut d’amour) und Fats Waller (Ain’t Misbehavin’, Honeysuckle Rose). Besagtes Werk war Bruchs Violinkonzert Nr. 1 in g-Moll, op. 26, das heutzutage bei Publikumsumfragen stets an prominenter Stelle steht, wenn es um populäre Violinkonzerte geht, und den Violinkonzerten von Beethoven, Mendelssohn, Brahms und Tschaikowsky als ebenbürtig betrachtet wird. Bruch wurde 1838 in Köln geboren und erhielt seine musikalische Ausbildung bei Ferdinand Hiller und Carl Reinecke. Im Sommer 1864, als er in Mannheim lebte und gerade den großen österreichisch-ungarischen Geiger Joseph Joachim kennengelernt hatte, begann er mit der Arbeit an dem g-Moll-Konzert. Während der verwickelten Genese des Werks zog Bruch 1865 nach Koblenz, wo ihm der Posten als Musikdirektor übertragen wurde, bevor er 1867 nach Sondershausen wechselte. Währenddessen überarbeitete er das Konzert „gewiss ein halb Dutzendmal“ und mehrere Geiger standen ihm mit Rat, insbesondere bezüglich der Solopartie, zur Seite, wobei der in dieser Hinsicht größte Beitrag von Joachim kam, der selbst ebenfalls ein bedeutender Komponist war. „Mein Violin-Concert avanciert langsam: ich fühle mich auf dem Terrain nicht sicher“, schrieb Bruch an seinen ehemaligen Lehrer Hiller im November 1865. Die scharfsinnige Kritikerin Clara Schumann zeigte sich dem Werk wohlgesinnt, als ihr das Manuskript vorgelegt wurde, so dass man wohl annehmen darf, dass es bereits zu dem Zeitpunkt Individualität offenbarte. Bruch wandte sich mit technischen Fragen an den Mannheimer Konzertmeister Johann Naret-Koning und zu Beginn des Jahres 1866 stellte er seinen Erstentwurf fertig. In dieser Fassung wurde es beim letzten Winterkonzert des Koblenzer Musik-Instituts am 24. April unter der Leitung des Komponisten uraufgeführt—Otto von Königslöw, der Konzertmeister des Gürzenich-Orchesters und Professor am Conservatorium der Musik in Coeln, spielte den Solopart. Bruch war von der Aufführung nicht überzeugt und schickte im Sommer das Manuskript an den in Hannover ansässigen Joachim. Im August erhielt er eine sehr detaillierte Antwort mit mehreren strukturellen Vorschlägen; zudem versicherte Joachim ihm, dass es angemessen sei, das Werk Konzert anstatt Fantasie zu nennen. Nachdem er seine Revisionen vorgenommen und sie Joachim auseinandergesetzt hatte, reiste Bruch nach Hannover, wo die beiden Männer zusammen an dem Werk weiterarbeiteten und es schließlich in der zweiten Version mit dem Hoforchester aufführten. Bruch erhielt zudem Rat von dem Dirigenten Hermann Levi und dem gefeierten Leipziger Violinvirtuosen Ferdinand David, und im Oktober 1867 nahm er zusammen mit Joachim in Hannover weitere Revisionen an seinem Werk vor. Am 5. Januar 1868 gab Joachim die Premiere der endgültigen Fassung in Bremen unter der Leitung von Carl Martin Reinthaler; weitere Aufführungen folgten in Hannover und Aachen. Am 6. Juli wurde es im Rahmen der Philharmonic Concerts in den Hanover Square Rooms dem Londoner Publikum vorgestellt, wobei W. G. Cusins das Dirigat hatte und der österreichische Konzertmeister des Orchesters, Ludwig Straus, die Solopartie übernahm. Der Kritiker der Londoner Times befand das Werk als „voller Überheblichkeit und dabei recht belanglos“—ein Urteil, das die Nachwelt nicht bestätigt hat. Der spanische Geiger Pablo de Sarasate, der zu einem aktiven Verfechter der Werke Bruchs werden sollte, gab am 3. Februar 1872 die amerikanische Premiere in New York mit dem New York Philharmonic unter Carl Bergmann und führte das Werk zudem in Paris, Lyon und Brüssel auf. Bruch folgt dem Beispiel Mendelssohns insofern, als dass er die drei Sätze fast ohne Pausen ineinander übergehen ließ. Zu Beginn zollt er Beethoven mit einem leisen Paukenwirbel Tribut und orientiert sich dann wiederum an Mendelssohn, indem er ohne ein volles Orchestertutti fortfährt. Stattdessen reichen Orchester und Solist kurze Figuren hin und her, bevor das Orchester das Allegro moderato schließlich in Gang bringt. Bruch gestaltet diesen Satz sorgfältig als Vorspiel—obwohl es sich hier im Großen und Ganzen um eine Sonatenhauptsatzform mit den charakteristischen zwei unterschiedlichen Themen handelt, verkürzt er die Reprise derart, dass praktisch nichts übrigbleibt. Daraufhin kehren die Anfangsfiguren zurück und das Orchester leitet eine nachdenkliche Passage für den Solisten ein, die dann in das herrliche erste Thema des Adagios übergeht. Auch dieser wunderschöne Satz—das Herzstück des Konzerts—steht an für sich in der Sonatenhauptsatzform, doch ist die Reprise wieder radikal verkürzt. Das Finale (Allegro energico) wird vom Orchester eingeleitet und die Solovioline beginnt mit einem ungarisch eingefärbten Thema—zweifellos eine Hommage an Joachim—mit charaktervollen Doppelgriffen. Es ist sehr ungewöhnlich, alle drei Sätze eines Instrumentalkonzerts in Sonatenhauptsatzform vorzufinden, doch, wie bereits angemerkt, behandelt Bruch diese Form in origineller und faszinierender Weise. Das zweite Thema des Finales hat eine breitere Anlage und gibt dem Solisten Gelegenheit, sich zu entfalten. Im abschließenden Presto werden beide Themen in äußerst spannender Weise miteinander kombiniert. Das Konzert g-Moll war schon immer Bruchs populärstes Werk und stellte selbst zu Lebzeiten des Komponisten seine andere Musik in den Schatten—sehr zu seiner Irritation. Die Länge des Konzerts machte es sehr programmierfreundlich und dank seines ausgeprägten melodischen Profils konnte das Publikum gleich beim ersten Hören etwas damit anfangen. Seine Position im Repertoire festigte sich zudem in den 1950er Jahren, als sich herausstellte, dass es die ideale Länge für eine LP-Seite hatte, und viele Plattenfirmen es mit dem e-Moll-Konzert von Mendelssohn kombinierten. Nachdem er es für die Summe von 250 Talern an den Verleger August Cranz verkauft hatte und damit weiterer Tantiemen verlustig ging, zog Bruch keinen finanziellen Nutzen aus der Popularität des Werks—es hätte ihm in seinen letzten Lebensjahren eine Pension einbringen können, als er in Armut lebte. Der Gipfel der Beleidigung bestand dann darin, dass er sechs Monate vor seinem Tod von den amerikanischen Schwestern Rose und Ottilie Sutro, für die er sein Konzert für zwei Klaviere geschrieben hatte, um das Manuskript betrogen wurde.